Our regular coffee mornings at the Red Lion are always popular, and August’s event will have the added attraction of fine weather – so the courtyard is available too – with sunny and shady spots its perfect for mingling and chatting. £5 gives you tea or coffee, and a slice of cake to enjoy in the lovely environment of this Michelin-listed restaurant. There is no need to spend more, but our coveted Shotley Seals in ceramic form are available to buy for £10 as is the Art on offer. The artist of the month is invited to show their work, which is displayed on the wall for 1 month. Each artist brings a different style, always interesting and enjoyable to meet the artist. The cakes are home made by volunteers and are considered a real treat – from fresh fruit cream cakes, to gin and tonic cake, there is something to appeal to all, including a savoury sausage roll if you don’t like cake ! 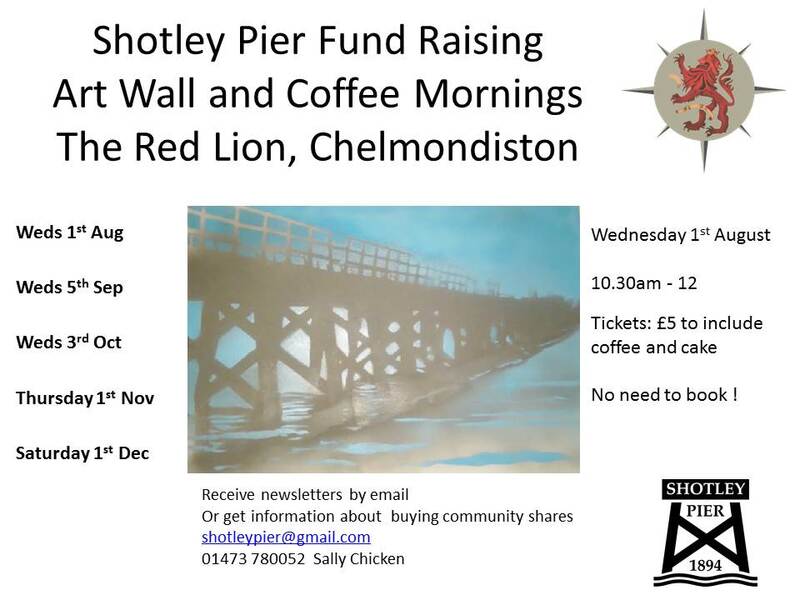 We thank Mandy and Dougie of the Red Lion for their very generous donation of time and refreshments each month as this allows us to donate 100% of the £5 ticket price to the Pier fund.